PasteColor is a Windows color picker helper tool that helps you copy or paste color values with ease. You probably know the situation when you know a color code (e.g. #924519) and would like to paste it into the Windows color picker. Yes, you can't, as there is no input box or button for that. You have to find out the RGB values and type the 0-255 numbers MANUALLY into the corresponding red-green-blue fields (yikes!). And, of course, the same holds true for the copy part. Now let's copy this color code... wait! I can't! 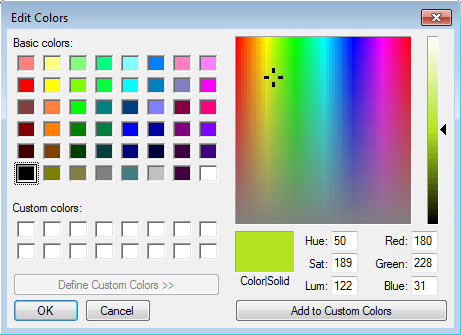 PasteColor helps copying or pasting color codes to Windows color picker by showing an input box where you can enter specific keywords. Click on "OK" or hit "Enter"
After launched, PasteColor sits on the system tray. Double-clicking on it or selecting "Settings" from the right-click tray menu will bring up the "Settings" window. Show tray icon: whether to show or hide the tray icon. If you hide PasteColor, launch it again to show the "Settings" window where you can check this setting again. You can also use the keyword "settings" to show the "Settings" window (see the "Keywords" section below). Send delay: delay time in milliseconds between sending keystrokes. Try increasing the value when experiencing issues with PasteColor. Default: 0. 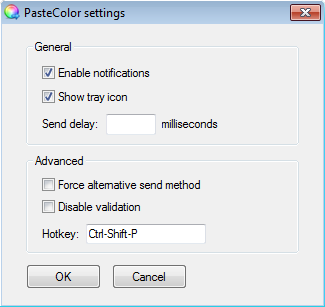 Force Alternative Send method: PasteColor automatically switches to an alternative send mode when the default mode would fail. In this mode "TAB" is used to jump to the next control which is slower but more compatible. 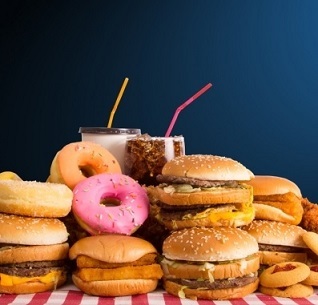 You can force this alternative method by checking this option. Disable validation: some color pickers includes "%" or other signs that would not make through PasteColor's color validation. By checking this option you can disable this check. Hotkey: this is where you can set your own hotkey to show PasteColor's input box. Default is "Ctrl-Shift-P". "c[n]" will copy N number of input fields' value. For example, "c4" copies the value of four input fields to clipboard, resulting "23,55,98,100" (e.g. for CMYK color palettes). Useful if you need to copy values from arbitrary number of input fields. Note that no color conversion is performed this case. "paste" or "p" will paste comma-delimited values on clipboard to input fields. Repetition is determined by the number of commas found in the clipboard string (note: "p" performs no color validation check). "p 23,44,55,88,30" will paste 23, 44, 55, 88 and 30 to input fields. You can use arbitrary number of elements separated with commas. You can define your own colors in the "Settings.ini" file under the "USERCOLOR" section, e.g. MyCorporateGreen = #071. Then enter "MyCorporateGreen" (without the quotes) to PasteColor's input box to paste color "#071". Any number of custom colors can be defined. This feature has no GUI at the moment. 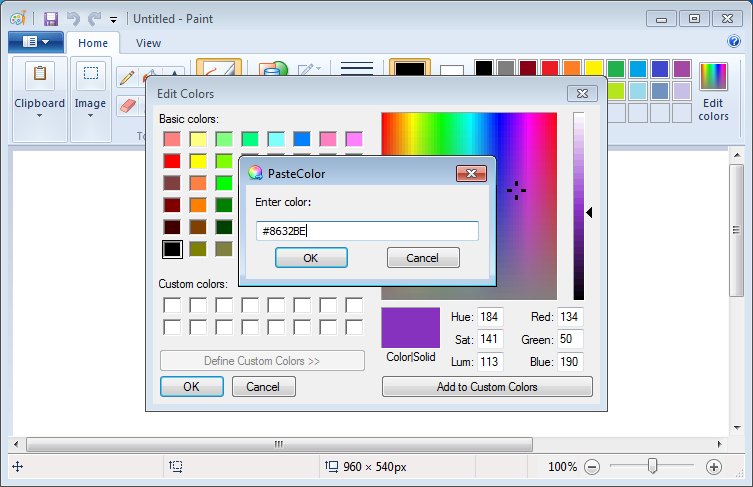 PasteColor's main target is the built-in Windows color picker but can be used in other applications as well. If you experience issues in an application, try checking "Force alternative Send method" or increase the "Send" delay in PasteColor's settings. 731 1,484 Roland Toth <img src="https://www.oldergeeks.com/downloads/gallery/thumbs/PasteColor1_th.png"border="0"> Jul 13, 2018 - 10:48 0.1 1.62MB ZIP , out of 7 Votes.